Athletics: Connie Mack (mgr. ), Frank Baker, Chief Bender, Eddie Collins, Eddie Plank. Giants: John McGraw (mgr. ), Rube Marquard, Christy Mathewson. Philadelphia third baseman Frank "Home Run" Baker earned his nickname during this Series. His home run in Game 2 off Rube Marquard was the margin of victory for the Athletics, and his blast in Game 3 off Christy Mathewson tied that game in the ninth inning, and the Athletics eventually won in the eleventh. The Giants never recovered. 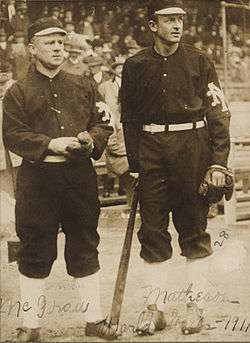 An ironic sidelight was that Mathewson (or his ghostwriter) had criticized Marquard in his newspaper column after Game 2, for giving up the gopher ball, only to fall victim himself the very next day. Baker was swinging a hot bat in general, going 9 for 24 to lead all batters in the Series with a .375 average. According to his New York Times obituary [July 28, 1971], Giants catcher Chief Meyers threw out 12 runners, creating a record for the most assists by a catcher during the World Series. With a perfect top of the first, Christy Mathewson set the record with 28 straight shutout innings in World Series play, a record that would be broken by Boston Red Sox Babe Ruth with 29 2/3 innings in the 1918 World Series. Mathewson's postseason record for consecutive scoreless innings against one team would not be broken until 2013 when Detroit Tiger's Justin Verlander shut out the Athletics (now playing in Oakland) for 30 consecutive innings in the 2012 and 2013 ALDS. 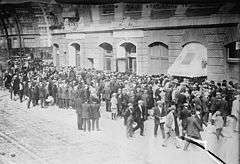 ↑ "1911 World Series Game 1 – Philadelphia Athletics vs. New York Giants". Retrosheet. Retrieved September 13, 2009. ↑ "1911 World Series Game 2 – New York Giants vs. Philadelphia Athletics". Retrosheet. Retrieved September 13, 2009. ↑ "1911 World Series Game 3 – Philadelphia Athletics vs. New York Giants". Retrosheet. Retrieved September 13, 2009. ↑ "1911 World Series Game 4 – New York Giants vs. Philadelphia Athletics". Retrosheet. Retrieved September 13, 2009. ↑ "1911 World Series Game 5 – Philadelphia Athletics vs. New York Giants". Retrosheet. Retrieved September 13, 2009. ↑ "1911 World Series Game 6 – New York Giants vs. Philadelphia Athletics". Retrosheet. Retrieved September 13, 2009.